Gaelic speech has, in recent years, become associated with the far north western Hebrides, and as such it is easy to lose sight of the fact that it was only in recent generations that it has ceased to become the language of the countryside within less than an hour’s drive of Glasgow. Gaidhealtachd areas, or areas where peoples’ daily language was Gaelic, were much closer to the city of Glasgow than is often now realised. This can be seen on this map, above, showing the areas to which Gaelic speech had retreated by 1745-46. Earlier on, when the University was founded, Gaelic speech may have been found in the countryside a little closer to urban centres such as Dumbarton and Edinburgh. This is suggested by the comments of Sir Thomas Craig in his De Unione Regnorum Brittaniae Tractatus, 1605, which advocated a full, thoroughgoing implementation and extension of the regal union of 1603. Sir Thomas mentioned that he remembered in his youth that a pure form of Gaelic had been widespread in Stirlingshire and in Dumbartonshire but that this had now receeded. Scots (rather than English) had now replaced this. For Sir Thomas, advocating greater integration and union with England, this was clearly a good thing and he looked forward to the day when the same process could be extended throughout Gaelic Scotland. Sir Thomas Craig would have disappointed, however, with the speed of the decline of Gaelic speech. Gaelic speakers, native to these areas, could be found in Cowal, Arran, Bute, Dunbartonshire, Stirlingshire and Perthshire as recently as the nineteenth century and into the early decades of the twentieth century. When the University of Glasgow was founded, indeed, in 1451, many of the parish churches which were incorporated into the University, and from which it drew revenue, Kildalton, Kilchoman and Killarow in Islay, Dunoon in Cowal, Rothesay in Bute were in Gaidhealtachd or Gaelophone areas. Similarly, areas in close proximity to Glasgow: Arran, the Lennox, Argyll and the Isles, together with Galloway and Carrick to the south were very much strongholds for Gaelic. The University of Glasgow was, from the very beginning, intended to draw in students from these Highland (and lowland) Gaelic speaking areas as well as from neighbouring Ireland. A number of students can be readily identified as coming from the Highlands and Islands and a number of Gaelic Irish students also attended the University of Glasgow during the sixteenth century. Gaelic (under the auspices of Celtic) has only been taught as a degree subject at University since 1906-07, yet Gaels can always be found as a minority within the University community. At the time of the foundation of the University, 1451, this minority might have been larger than one expects. Nowadays only around 1% of Scots speak Gaelic. John Mair, Principal of the University of Glasgow (1518-1523), was a Lothian man and did not speak Gaelic. He mentioned, however, in his History of Greater Britain (1521), that Gaelic was still the language of half the kingdom. This was an estimate but probably not too far off the mark. The population of Scotland was much more evenly distributed throughout the kingdom in earlier periods than it has become over the last 250 years. Those living in northern and western parts of the kingdom spoke Gaelic. ‘Highland’ areas such as the Lennox, adjacent to Glasgow, were Gaelic in speech. Carrick in Ayrshire to the south was also a Gaidhealtachd area at this time. Indeed, Glasgow graduate Walter Kennedy, MA, 1478, from Carrick, a prominent Scots poet, was also criticised in a verbal flyting or dispute by the poet William Dunbar for his Gaelic background and habits of speech. Kennedy replied that Gaelic (or Ersch) should be the language of all true men in this kingdom. Despite Kennedy’s spirited rejoinder to Dunbar, the fact that we have no record of Kennedy’s writings (if he had any) in Gaelic and that a number of Kennedy’s poems in Scots survives, is a telling comment on the relative status of the two languages. (The connection with Kennedy was continued through his son who was made Rector of the University of Glasgow in 1525 and who was also probably a Gael.) Although half the population still spoke Gaelic in John Mair’s day, the language was already being identified with the rural and the backward in contrast to Scots (and Latin) which were perceived to be the languages of education and progress in Scots-language speaking cities. Perceptions of the relative worth of both languages, and the fact that the centres of commerce and government were non-Gaelophone, means that most of the surviving documentation from the area related to Gaels in this period is in Scots or Latin. Gaelic, universally spoken in Highland areas, was not, seemingly, widely written, although some hereditary learned families, such as Beatons, MacMhuirichs and others, did continue to use Gaelic script for the purposes of poetry, genealogy and medicine. However, the lack of widespread Gaelic usage in ‘official’ contexts meant that Gaelic had, in some respects, assumed a ‘minority’ language mindset even while it was still spoken by up to half the population around 1500. This meant that Gaels in this period such as Walter Kennedy chose to write in Scots (or Latin). As a result of patterns such as this it is often difficult to identify people as Gaels in historical sources. The Hamiltons, for example, are not usually associated with Gaelic, yet this kindred had lands in the Isle of Arran which retained a Gaidhealtachd until modern times. The will of Alexander Hamilton, ‘regent in the pedagogy’ who died in 1547 numbers two pieces of ‘Irish clothing’ amongst his assets although there is nothing else there to suggest any connection to the Gaidhealtachd. Colquhoulns and Kennedys are both names and families associated with Gaelic at this time and it possible that those appearing on record in connection with the University, such as Adam Colquhouln, rector, 1529-32, had Gaelic speech. When Colquouln admitted ‘Nigel’ Lamont (Niall MacLaomuinn), rector of Craiginis, Argyll, as a member of the University one imagines that both men would have been Gaelic speakers. John Davidson, principal from 1556 to 1574 was, if not a Gael, then a native of an area, Fyvie in Aberdeenshire, which may have been fairly close to the linguistic border with Gaelic during the early sixteenth century. We can not always know what people spoke, whereas we can see what they wrote. Yet, if people came from areas that are known to have been Gaidhealtachd, it has to be assumed that they were Gaelic speakers. The nobility in this period (and generally up to the mid eighteenth century) in Highland areas all spoke Gaelic even though most of their writings tended to be in either Latin, Scots or English. Where people coming into the area did not have the ability to converse in Gaelic, especially if they were priests, this often generated considerable protest on the grounds that the clergymen were unable to carry out their duties due to ‘defect’ of language. This linguistic angle may have been used at times to raise complaints against clergymen for political reasons. Nevertheless the paperwork resulting from such disputes throws some light on the linguistic status of the area. The best defined and thus most ‘visible’ part of the pre-Reformation Gaidhealtachd (1560) especially with regards to its connections to the University of Glasgow is Argyll. Here, a major recent study by Iain G. Macdonald, Clerics and Clansmen, has examined the tensions that arose when non-Gaelic speaking clergy, unable to communicate with most of their parishioners, were intruded into the Argyll area [http://www.brill.com/clerics-and-clansmen]. It is fair to assume, on the other hand, that indigenous clergy with ‘Highland’ names spoke Gaelic. Prior to 1451, few clergy in Argyll seem to have been University educated. The foundation of the University of Glasgow, however, transformed the nature of the church in Highland areas, especially the areas of the Gaidhealtachd adjacent to Glasgow. According to Iain G. Macdonald, the establishment of the University of Glasgow ‘heralded a small-scale educational revolution’ in Argyll and the Isles, resulting in an influx of students from these areas. One of the earliest of these, an Archibaldus Campbell (Gilleasbaig Caimbeul), 1453, became a canon of the Island of Lismore (an area where Gaelic is still spoken). 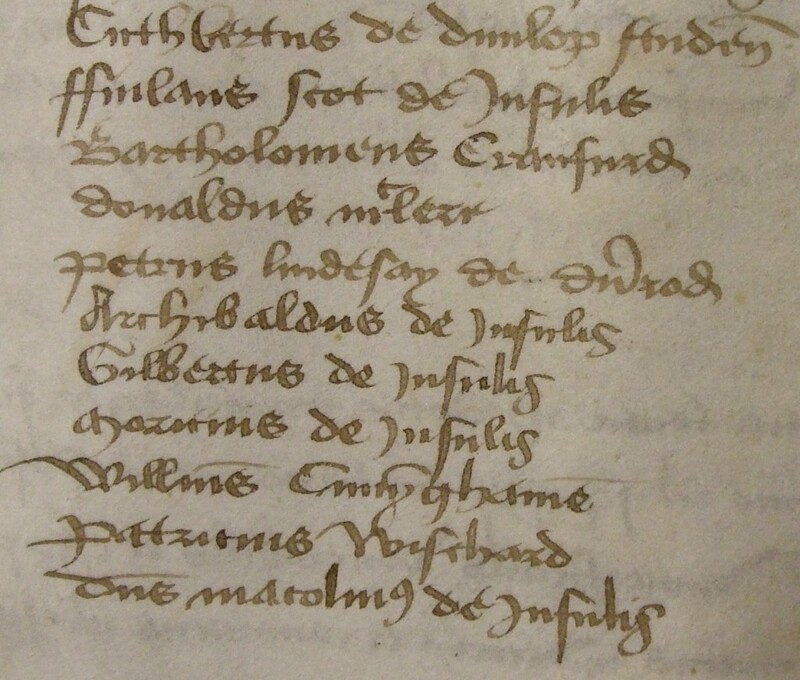 The University records also show a group of students attending in 1463, bearing the names Finlaus Scot de Insulis, Archibaldus de Insulis, Gilbertus de Insulis, Moricius de Insulis and Dominus Malcomus de Insulis. These must have been Gaels (although it is not sure who exactly they were) with their names Fionnlagh, Gilleasbuig, Gillebrìde, Murchadh, Calum rendered in Latin (photo below). The soubriquet ‘de insulis’ was often used to denote members of the Macdonald family of the Lords of the Isles. None of these individuals seem to be related to the known members of this family. Could it be that this might have been a group of students from the islands, sponsored, perhaps, by Eoin Macdonald, last Lord of the Isles? There seems to be no way of answering this at present. List of students as they appear written in the University roll, 1470. Five of these bear Gaelic names in Latin dress, with the additional appellation of ‘de insulis,’ of (or from) the isles. This image used by kind permission of the University of Glasgow Archive Services, University collection, GB0248, GUA 26613/38. Although some students from Argyll and other parts of the Gaidhealtachd still continued to attend St Andrews, Macdonald found that the indigenous clergy of Argyll, 1451-1560, increasingly favoured the University of Glasgow. 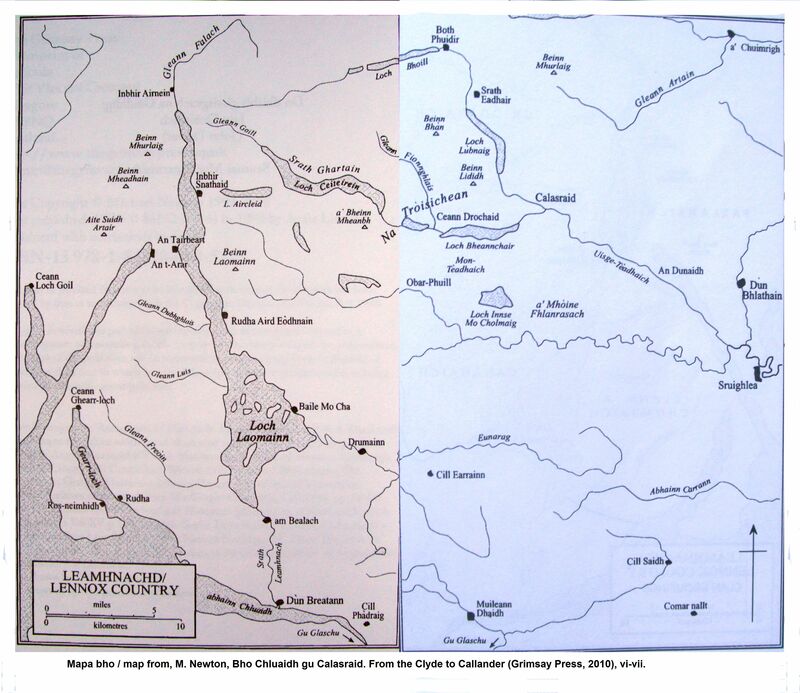 Many of these identified by Macdonald came from Clan Campbell, and included names associated with clans from the south western Gaidhealtachd such as Colquhouln (MacCombaich), MacTavish (MacThàmhais), Lamont (MacLaomainn), MacVicar (Mac a’Bhiocair), Makclaclane (MacLachlainn). At least two of those identified by Macdonald in his book, ‘Nygellus M’Murroicht’ 1528 (Niall MacMhuirich?) and Duncanus Ó Brolchán (Donnchadh Ui Brolcháin) who became a clergyman in Islay, may have belonged to some of the Gaelic hereditary “learned” families associated with the Gaelic manuscript and sculpture tradition. Argyll, in particular, is the area of the Gaidhealtachd most often associated with the University of Glasgow, for reasons of proximity (Aberdeen proving the most popular destination for students from the northern Gaidhealtachd by the seventeenth century). Gilleasbaig Caimbeul, the 4th Earl of Argyll, converted to Protestantism possibly as early as 1536 and his successors and his clan, the Clan Campbell, became staunch supporters of the Scottish Reformation, (1560), when the Church in Scotland broke with the Church of Rome. John Knox, the iconic early leader of the Reformation, famously preached at Castle Campbell (Clackmannanshire), one of the many strongholds of the Clan Campbell chiefs in 1556. Much as had been the case before the Reformation, the new Church of Scotland placed a premium on a University education and Gaels intending to become clergymen continued to attend the University of Glasgow. The University, which had been, and continued to be extremely close to the Church right up until the beginning of the twentieth century, suffered something of a shock from the Reformation, but revived from around the 1570s. The record of student names prior to 1578 is sparse, From the end of the sixteenth century onwards, however, the record is fuller and a steady trickle of names from the Gaidhealtachd appears among the surving lists of graduates throughout the seventeenth century. Most of these student year groups had a small number of Gaels, within their ranks at this time. Members of Clan Campbell appear with great regularity within these lists as do a range of recognisably Highland (and in this period this meant Gaelic) surnames from the southern and western Gaidhealtachd: MacLachlans, Darrochs, Camerons, Buchanans, Colquhoulns, Macleans, MacCalmans, Macleods, Galbraiths, MacAlisters, MacQuarries and others all of whom appear among lists of students at the University of Glasgow, 1578-1640. As noted above, the University was also, when it was founded, intended to serve Ireland, parts of which were as close to Glasgow as parts of the Scottish Highlands. Gaelic speaking students had come to Glasgow from the northern part of Ireland since 1451 although there is little record of their presence. Three students who appear to have Irish names, ’Cognatius Ocheyll, Duncanus Odoneyle, Nicholaius Ogalquhoir,’ appear in the University records, 1527-28. The University’s own records are patchy prior to 1578, partly, perhaps, as a result of the Reformation. Given the level of destruction that befell the native church and society in Ulster 1590-1610, due to warfare, occupation by English troops and the destruction of churches and often the clergy themselves, followed by dispossession and plantation, it is little surprise that records from the northern part of what had been Gaelic Ireland are sparse. George Montgomery, incoming Protestant Bishop of the dioceses of Clogher, Derry and Raphoe (1605-1610) had a survey made of Derry Diocese on his arrival there in 1606-7. This mentioned that three of the eleven native clergymen in the Diocese of Raphoe, Donegal, and two of the ten clergymen in Derry diocese had been educated in Glasgow. Those in Derry were John O’ Henney of Bannagher and John McColgan, son of the Rector of Donagh in Inishowen. Both were fluent in Irish and Latin and O’ Henney could speak Scots too. In the Bishopric of Raphoe, similarly, Donatus Maginnell and Nellanus McCallen (alias Groome) both of whom spoke Irish Latin and Scots and a Magonius McConnell, and probably Hugh O’ Donnell, the dean of Raphoe, also studied at Glasgow and spoke Scots. Apart from these fortuitous references there seems to be little surviving detail of which Gaelic Irishmen had been educated in Glasgow over the previous century and a half. It seems that they were the last Gaelic Irish students to attend Glasgow for some time. Latterly such students attending Glasgow, whether at grammar school or University, had been harassed due to their Catholicism and non compliance with Presbyterianism. This, together with the Plantation of Ulster from 1609, meant that Glasgow, with its Protestant ethos, was no longer an attractive destination. Gaelic speaking students from Ulster now increasingly opted to pursue their studies in Catholic centres such as Louvain. Indeed, one of these students who had attended Glasgow, c.1605-1607, John McColgan or Colgan (c.1592-1658), is very probably the same person who went on to become a Franciscan friar and a hagiographer on the continent and one of the leading scholars of his generation. Colgan, or Seán MacColgáin, was from a Gaelic clerical family, the MacColgans of Innishowen, Donegal. The Plantation of Ulster must have meant that there was little chance of him making a clerical career in Ireland. He left Ireland around 1612 and took holy orders on the continent. 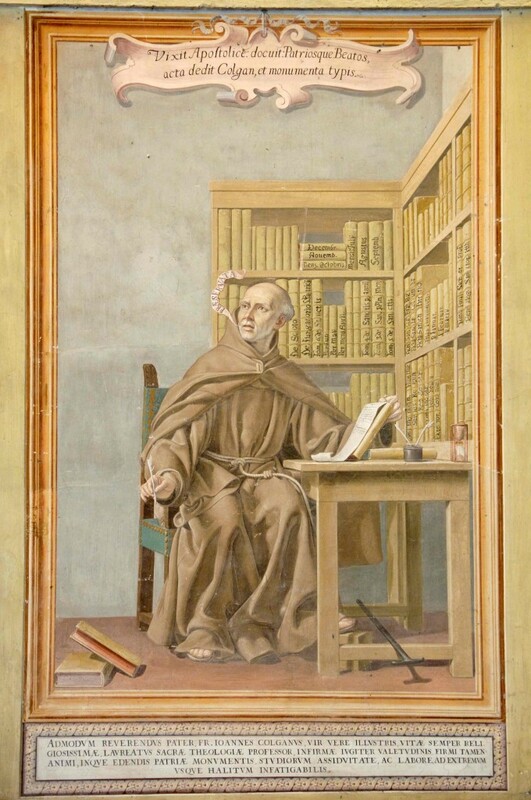 This photo, right, by Patrizio Gioberti, Rome, of a fresco made by Friar Emanuale da Como, around 1670 in San Isidoro, Rome, of Father Seán MacColgáin. With thanks to Professor Mícheál MacCraith, Ollscoil na hÉireann, Gaillimh (NUI, Galway), for permision to use this image. Colgan entered St Anthony’s College, Louvain in 1620 and quickly became involved in the project run by friars in this institution for the collection, preservation and reproduction of early Irish hagiographical materials. Colgan, due to his knowledge of Irish Gaelic, was ideally suited for the task of taking materials from Gaelic and repackaging them in Latin. He became Professor of theology at Louvain, around 1635 and published editions of the lives of Saint Patrick, Saint Brigit and Saint Colm Cille and several other volumes, including Acta sanctorum in 1645. 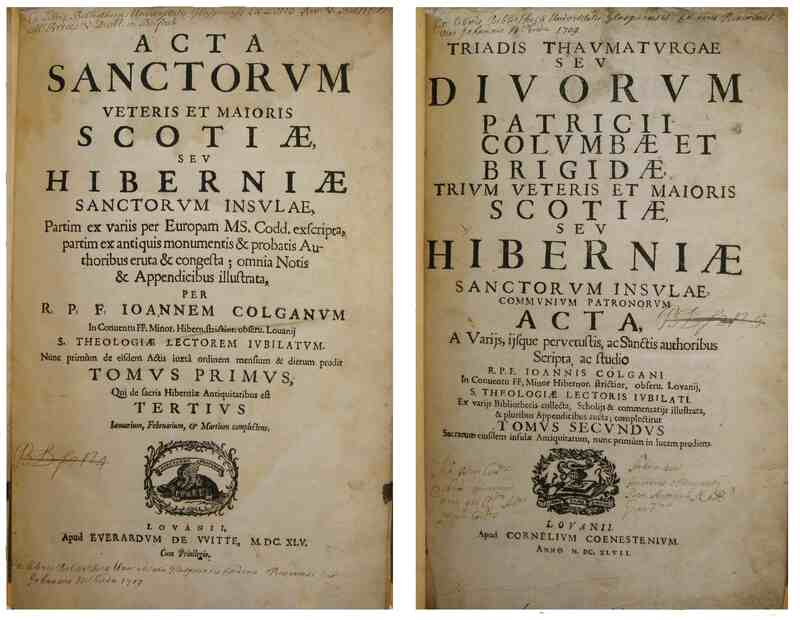 The title pages of two of Father Colgan’s books, Acta Sanctorum (1645) and Triadis Thaumaturgae (1647). Reproduced by kind permission of University of Glasgow Library, Special Collections. After Colgan’s time, and after the Plantation of Ulster, the students attending Glasgow University from Ulster during the seventeenth century (although there are a small number of exceptions) generally bore names associated with planter families. While some of these students from planter families may well have picked up Irish-Gaelic due to the prevalence of the language in the north of Ireland during their upbringing, they were primarily either Scots-language or English-language speakers. [1 ] ‘…I myself remember a time when the inhabitants of the shires of Stirling & Dumbarton spoke pure Gaelic. But nowadays that tongue is relegated… …so that one rarely comes upon any who speak it…’ These were the words of Sir Thomas Craig as translated from Latin to English in, C.S. Terry, ed., De Unione Regnorum Brittaniae Tratatum, by Sir Thomas Craig. Edited from a manuscript in the Advocates’ Library (Scottish History Society, Edinburgh, 1909), 288-9. See also, M. Newton, Bho Chluaidh gu Calasraid. From the Clyde to Callander. Gaelic songs, poetry, tales and traditions of the Lennox and Menteith. In Gaelic with English translations (Grimsay Press, 2010). [ 2 ] J. Durkan & J. Kirk, The University of Glasgow, 1451-1577 (Glasgow, 1977), 11, 42, 185-6, 308. [ 4 ] Priscilla J. Bawcutt, ‘Kennedy, Walter (1455?–1518? )’, Oxford Dictionary of National Biography, Oxford University Press, 2004 [http://www.oxforddnb.com/view/article/15395, accessed 2 Dec 2013]. http://www.universitystory.gla.ac.uk/biography/?id=WH18032&type=P&o=&start=60&max=20&l= . For Kennedy the younger, see also, C. Innes, ed., Munimenta Alme Universitatis Glasguensis (=MAUG) (4 vols., Maitland Club, Glasgow, 1854), ii, xxiv, 150. [https://archive.org/details/munimentaalmeuni02mait>]. [ 6 ] N. Lamont, ed., Inventory of Lamont Papers, 1231-1897 (Scottish Record Society, Edinburgh, 1914), 38 [This is available on the Internet Archive, at: <https://archive.org/stream/scottishrecordso54scotuoft#page/n7/mode/2up>]. Durkan & Kirk, The University of Glasgow, 1451-1577, 306, 400. [ 7 ] I.G. Macdonald, ”That uncouth dialect.’ English-speaking clergy in late Medieval Gaelic Scotland,’ in Records of the Scottish Church History Society, 43 (2014), 1-29, at 2 & 29. [ 8 ] For the family members of Clan Donald in this period, see J. Munro & R.W. Munro, eds., Acts of the Lords of the Isles, 1336-1493 (Edinburgh, 1986), 278-315. [ 9 ] Ian Macdonald, Clerics and Clansmen. The Diocese of Argyll between the Twelfth and the Sixteenth centuries (Brill, Leiden, 2013), 208-209, 210-212, 218-223, 362-365. MAUG, ii, 70. For families of the Aos-dàna, a herditary learned caste, see the article by the late Professor Derick Thomson, former head of Celtic at the University of Glasgow (1963-1991). D.S. 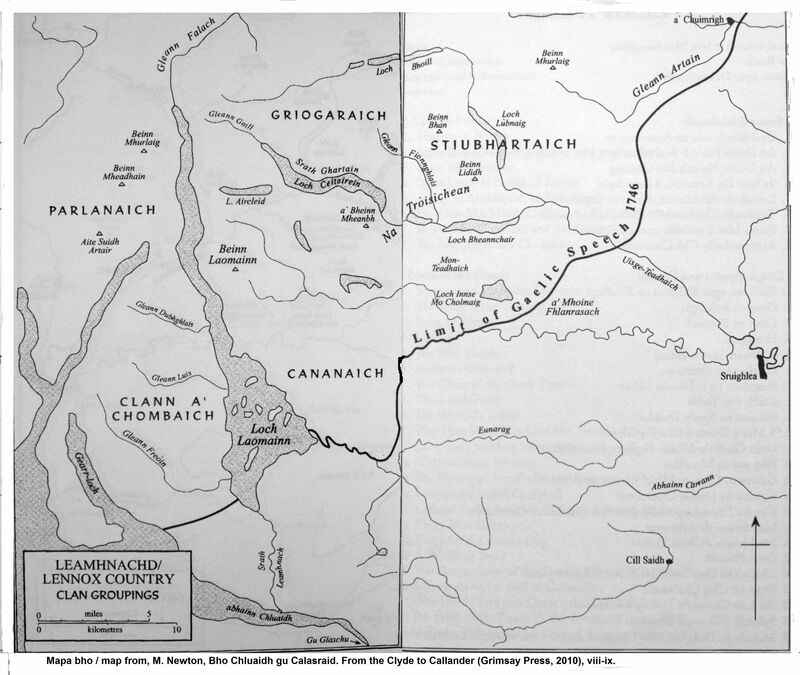 Thomson, ‘Gaelic learned orders and literati in Medieval Scotland,’ ann an Scottish Studies 12 (1968), 57-78. See also the article by current Glasgow University history lecturer, Dr Martin MacGregor. M. MacGregor, ‘Church and Culture in the late medieval Highlands,’ in, J. Kirk, ed., The Church and the Highlands (Edinburgh, 1998), 1-35. [ 10 ] J.R.N. Macphail, ed., Highland Papers, volume 2 (Edinburgh, 1916), 100-101. J.E.A. Dawson, The Politics of Religion in the Age of Mary Queen of Scots. The Earl of Argyll and the Struggle for Britain and Ireland (Cambridge, 2002), 17 (& note 21), 24. [ 11 ] A.L. Brown & M. Moss, The University of Glasgow: 1451-1996 (Edinburgh University Press, 1996), 7-9. [ 13 ] Brown & Mosse, The University of Glasgow, 1451-1996, 7. MAUG, ii, 153. [ 14 ] H.A. Jeffries, ‘Derry Diocese on the Eve of the Plantation’, 175- 204, ann an G. O’ Brien & W. Nolan, eds., Derry and Londonderry: Interdisciplinary essays on the history of an Irish County (Dublin, 1999), 175, 191. [ 15 ] A.F. O’ D. Alexander, ed., & Transl., ‘Bishop Montgomery’s Survey of the Bishoprics of Derry, Raphoe and Clogher’, part of ‘The O’ Kane Papers,’ in Analecta Hibernica 12 (1943), 67-128, aig 102-104. B. MacCuarta, Catholic Revival in the North of Ireland, 1603-41 (Dublin, 2007), 22. J. Durkan (J. Reid Baxter, ed. ), Scottish Schools and Schoolmasters, 1560-1633 (Scottish History Society, Woodbridge, 2013), 192. ‘Extracts from the Registers of the Presbytery of Glasgow, from November 1592 to March 1602,′ in, J. Dennistoun & A. Macdonald, eds., Miscellany of the Maitland Club, vol 1, part 1 (Glasgow, 1833), 51-96, at, 90, 94. MacCuarta, Catholic Revival in the North of Ireland, 1603-41, 28-29. B. MacCuarta, ‘The Catholic Church in Plantation Ulster,’ in, É Ó Ciardha & M. Ó Siochrú, eds., The Plantation of Ulster. Ideology and Practice (Manchester, 2012), 119-142, at, 121-2. Although this is generally the case, some Gaelic Irishmen did attend the University following the Plantation of Ulster. One such case concerned Jeremie O’ Queine, a Gaelic speaking Presbyterian Irishman from Antrim who graduated from Glasgow in 1644. He was offered the charge of Inveraray but there is no evidence he took up the offer. F. Macdonald, Missions to the Gaels. Reformation and Counter-Reformation in Ulster and the Highlands and Islands of Scotland (Edinburgh, 2006), 111-112. C.N. Ó Clabaigh. ‘Colgan, John,’ in the Dictionary of Irish Biography (Royal Irish Academy & Cambridge University Press), available to subscribers on the internet at: <http://dib.cambridge.org/home.do>. P. Ó Riain, ‘The Louvain achievement II: Hagiography,’ in, E. Bhreathnach, J. MacMahon & J. McCafferty, eds., The Irish Franciscans, 1534-1990 (Four Courts Press, Dublin, 2009), 189-200. C. Mooney, ‘Fr John Colgan and the Louvain school,’ in N. Ó Muraíle, ed., Mícheál Ó Cléirigh, his associates and St Anthony’s Colllege, Louvain (Four Courts Press, Dublin, 2008), 225-230. Thanks to Dr Geraldine Parsons, University of Glasgow, for these references. N. Canny, Making Ireland British, 1580-1650 (Oxford, 2001), 442, 450-454. Many students describing themselves as ‘Hibernus’ post 1609 had names of southern Scottish or English origin. By the end of the century, especially after 1690 and in the early eighteenth century students from Ireland attending the University of Glasgow routinely described themselves as ‘Anglo-hibernus’ or ‘Scotto-hibernus.’ MAUG, iii, 41-59. 115-256.